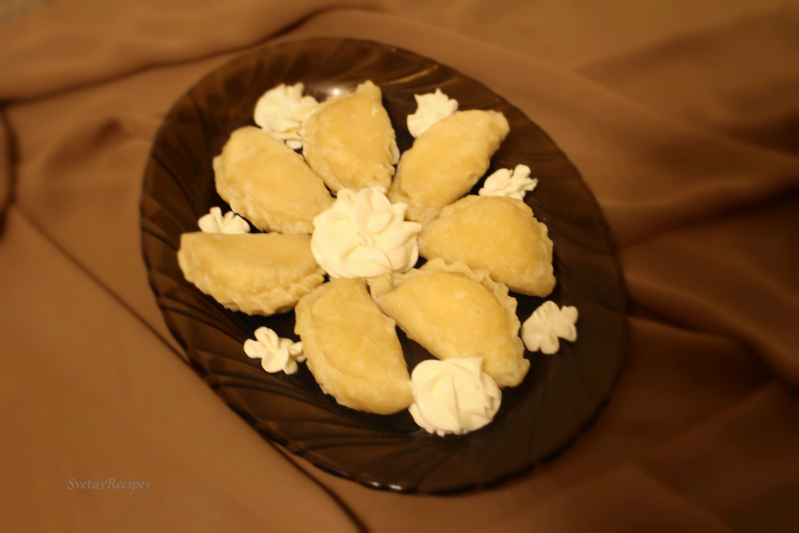 Ukrainian dumplings with cheese, its also a classic national Ukrainian dish. 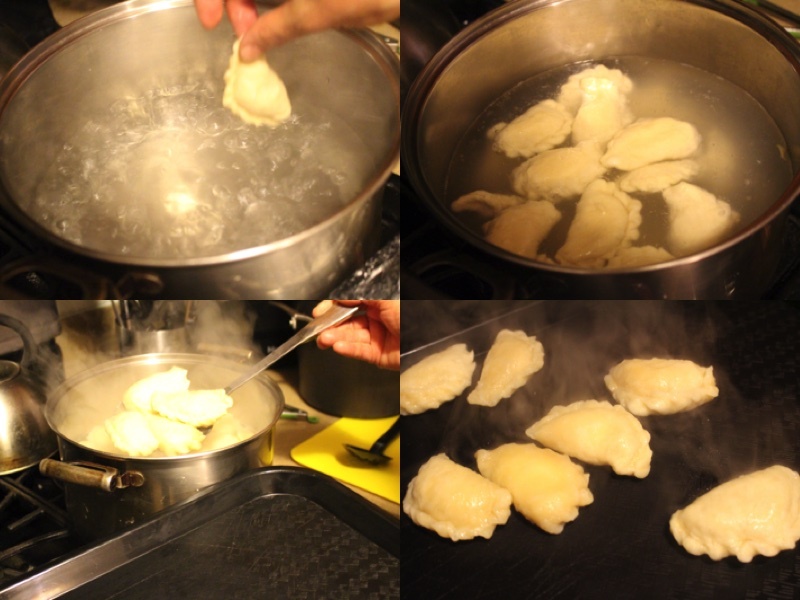 The recipe itself is very old and has been passed down many generations of families until today. If you would like a custom job you can use what ever filling you would like to. You most likely grew up on these. It can also be made with cabbage, mushrooms, cheese, potatoes and more. Though today we will be making it with cheese, usually I make many servings of this dish and save it for other times. 1.) In medium bowl mix all ingredients for dough. 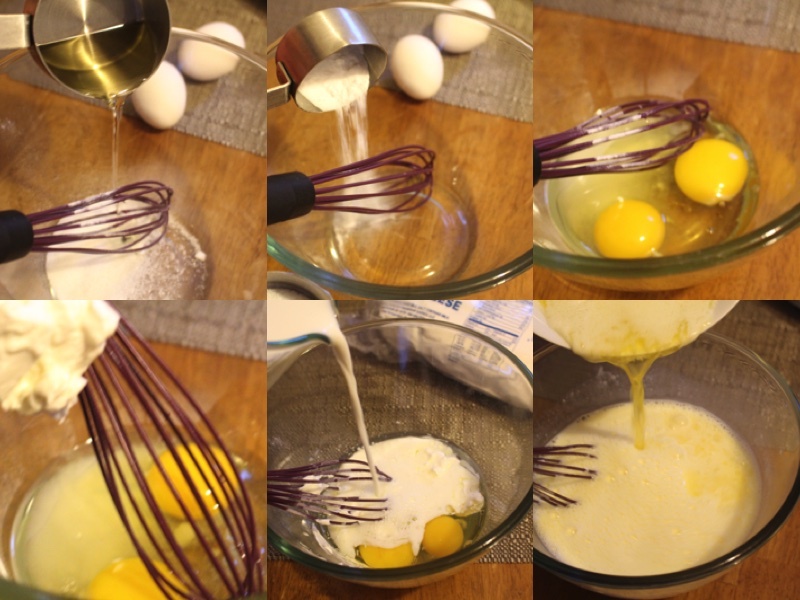 In a separate bowl beat eggs, once completed combine the two bowls. 2.) Make a small volcano in the flower and pour the mixture from the bowl inside. Mix together well, On a flowered surface kneed until smooth and elastic. Cover dough with plastic wrap and let it rise for 30min. 3.) After it has risen divide the dough into 2 separate pieces. On a flowered surface carefully roll out a thin strip of dough. With a small whine glass cut mini circles. 1.) Add sugar and eggs to the cheese and mix together well. 2.) 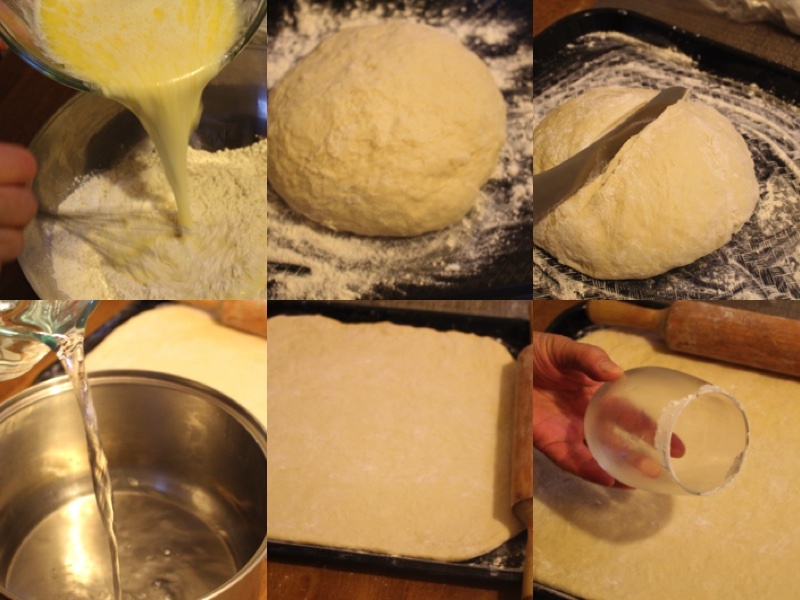 On a flower surface: In the middle of each circle put a teaspoon of the cheese mixture. 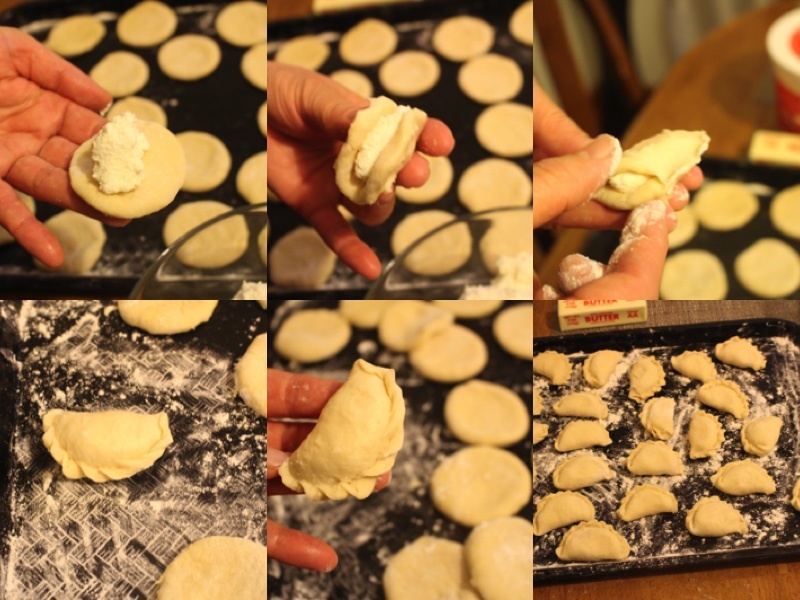 With your fingers fold dough over the filling. With fingers press edges together. 3.) Place into a pot that has boiling water. Cook for 5-6 min on high heat. After turn off the heat and drain. In medium bowl mix all ingredients for dough. In a separate bowl beat eggs, once completed combine the two bowls. Make a small volcano in the flower and pour the mixture from the bowl inside. Mix together well, On a flowered surface kneed until smooth and elastic. Cover dough with plastic wrap and let it rise for 30min. After it has risen divide the dough into 2 separate pieces. On a flowered surface carefully roll out a thin strip of dough. With a small whine glass cut mini circles. 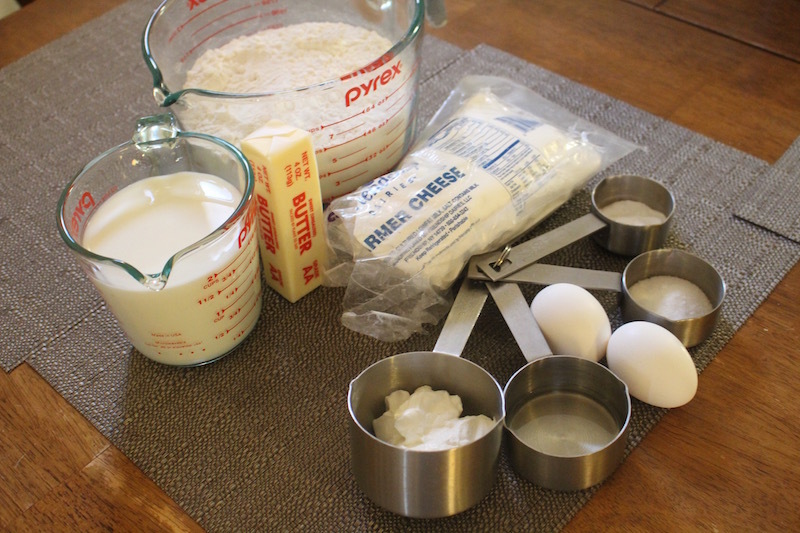 Add sugar and eggs to the cheese and mix together well. On a flower surface: In the middle of each circle put a teaspoon of the cheese mixture. 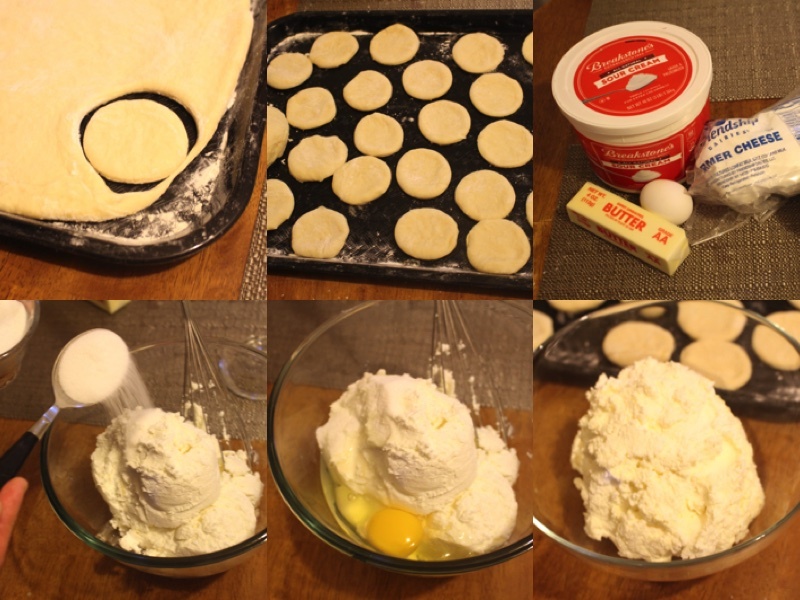 With your fingers fold dough over the filling. With fingers press edges together. Place into a pot that has boiling water. Cook for 5-6 min on high heat. After turn off the heat and drain.